41 anglers turned out for this feeder only match. Rules were exactly the same as the Golden Rod Feeder Championship and most the field were qualifiers from the Golden Rod Matches. Conditions were very diffrent from the previous day which had produced weights over 200lbs. With an easterly wind and cooler tempratures, bites were difficult to say the least. Winner on the day was Simon Richardson (Dot em Down / Fatty’s) who drew peg 4 on the Specimen Lake. Simon Caught with a white waffter on the method down his edge landing 5 carp that weighted 74-09-00. 2nd on the day was Matt Blackmore (Garbolino / dynamite baits) who drew peg 54 on the Match Lake. With an hour to go Matt was going know where with just one fish. Fishing the method down his edge, Matt found quality carp late to weigh 42-01-00. 3rd on the day was Paul Cook (Frenzee) who drew peg 8 on the Match Lake. Paul fished method waffter to weigh 39-12-00. 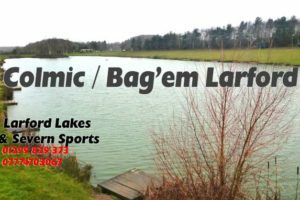 4th in the match was Phil Briscoe (Colmic Larford) who drew peg 78 on the Specimen Lake. Phil fished method with corn and waffters landing carp and bream to weigh 35-09-00. 6th on the day was Martin Eddis (Larford) who drew peg 18 on the Match Lake landing 30-01-00 to method and waffter.